On March 5, 2012, Oakley entered into a Covenant Not to Sue either Predator Outdoor Products or Hunter Specialties under U.S. utility patent 5,387,949 (“the ‘949 patent”). The covenant not to sue was executed on the same day as the Markman hearing in the matter of Oakley v. Predator Outdoor Products et al. (case no. 8:2011-cv-00456, in the U.S. District Court for the Central District of California). As we previously reported, Oakley originally alleged infringement of both the ‘949 patent and the U.S. design patent D523,461 (“the D461 patent”). However, as a result of the covenant not to sue under the utility patent, the D461 patent is currently the only remaining patent at issue in this case. 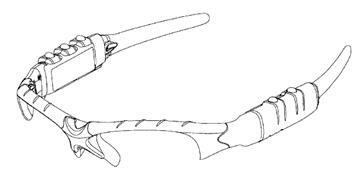 The D461 patent claims “the ornamental design for an eyeglass component, as shown and described,” below. At the outset, the court stated that “[t]he conclusion that these features serve a defined utilitarian purpose is not dispositive as to whether the features are functional in the sense that they are not entitled to design patent protection.” Order, page 5. Instead, the court clarified that “the design of a useful article is deemed to be functional when the appearance of the claimed design is dictated by the use or purpose of the article. Order, page 5 (quoting L.A. Gear, Inc. v. Thom McAn Shoe Co., 988 F.2d 1117, 1123 (Fed. Cir. 1993)). Interestingly, in dismissing the defendants’ functionality arguments, the court pointed to the defendants’ own utility patent applications to demonstrate “alternatives for accomplishing the functions of storing electronic components in eyewear and providing nose support for eyewear.” Order, page 5. Further, in concluding that no claim construction was necessary due to functionality, the court analogized the features in the D461 patent to those found not strictly functional in L.A. Gear and Rosco, Inc. v. Mirror Lite Co., 304 f.3d 1373, 1378-79 (Fed. Cir. 2002), and distinguished the facts of Richardson v. Stanley Works, Inc., 597 F.3d 1288, 1294 (Fed. Cir. 2010), where the Federal Circuit concluded that design features were “purely functional elements.” Order, page 6.